Furniture, clothing and many other products used in households are exposed to noxious chemicals during their manufacturing process. These chemicals can be absorbed by various types of surfaces, especially porous materials, and many are classified as volatile organic compounds, or VOCs. These substances are notorious for causing irritation and allergic reactions in humans, and have also been associated with more severe health conditions after prolonged exposure. How does temperature affect VOC off gassing? New furniture, clothing and devices contain a larger concentration of VOCs, since they have not had the time to release them. As a result, off-gassing tends to be higher in new constructions, after purchasing furniture, or after a major renovation. Many chemical processes are accelerated at higher temperature, and this includes off gassing. According to data collected from multiple indoor locations with Foobot air monitors, the off-gassing rate is increased significantly during the summer, when ambient temperatures are higher. Off-gassing has become a more relevant problem in newer buildings, due to a major change in global construction practices. Older buildings were designed to have plenty of natural ventilation and ample window area, which limited the accumulation of air pollutants; on the other hand, newer buildings are designed to be airtight, with the goal of improving energy efficiency. However, airtightness also creates conditions for higher air pollutant levels, unless spaces are properly ventilated. 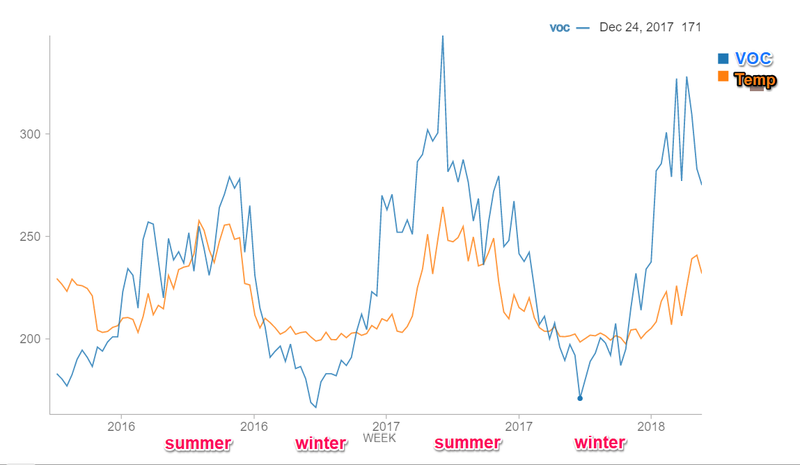 Note how VOC concentrations fall below 200 ppb during winter, reaching peak values above 300 ppb during summer. This is very relevant information for building owners seeking to improve their indoor air quality – for example, if ventilation systems are controlled only based on occupancy, they cannot respond to the extra VOC pollution present during summer. Many objects commonly found indoors emit chemicals into the air, but some sources are notorious for how quickly they release them. Below are some of the main examples. 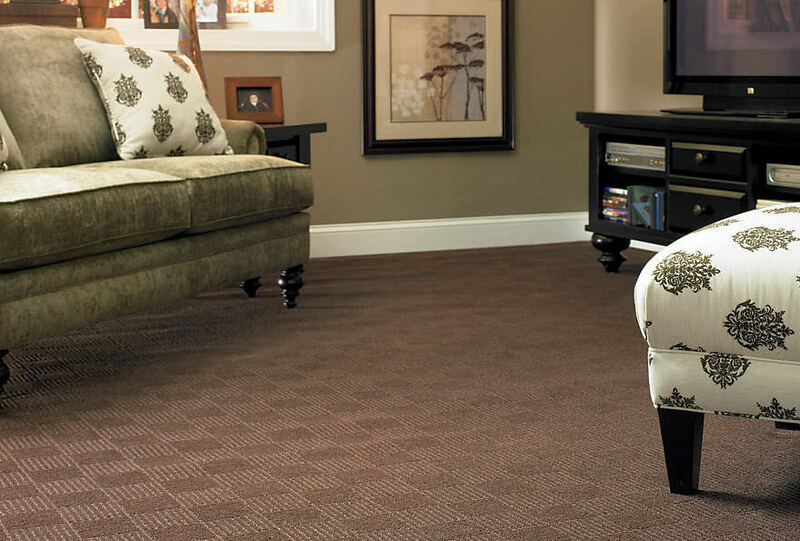 Off gassing is commonly happening in new products like wood furniture or couches, and carpeted floors. Furniture made from particle board or plywood: Wood products contain formaldehyde, a VOC that is highly irritating for the eyes and respiratory system, and also a carcinogen. Particle board and plywood have higher concentrations of the substance due to their porous nature, which means emissions are less drastic with solid wood products or used furniture that has already had time to off-gas. Note that off-gassing slows down over time – wood products release formaldehyde for their entire service life, but most of it happens during the first year. Glue used with carpeted floor. Electronic devices: Many components used in electronic devices release VOCs, especially insulation materials with flame retardants. In this case, the rate of release is not only influenced by room temperature, but also by the heat produced internally when electronic devices operate. Mattresses, carpets and couches: When you purchase a new bed, carpet or couch, the room where it will be used may require additional ventilation for some time. These pieces of furniture are very porous and carry large amounts of VOCs left over from the manufacturing process. Paint: Recently applied paint releases VOCs at a very fast rate. As a result, the out-gassing effect from paint is significant in new constructions, and also in renovated areas that have been repainted recently. Just like in the case of wood products, the out gassing rate slows down over time. New houses, with fresh paint and wood flooring, hence are particularly prone to high VOC concentrations. Removing the source, or minimizing emissions if removal is not possible. For example, you can use furniture made from hardwood instead of particle board, and specify low-VOC paint for new constructions and renovations. Increase ventilation to overcome the off-gassing rate. To accomplish this without wasting energy, you can control ventilation based on VOC measurements – running fans at full power 24/7 is not cost-effective. Filtering VOCs out of the air. This can be accomplished artificially with air purifier systems, your HVAC system or naturally with plants that are capable of absorbing VOCs. NASA published an interesting list of the best plants to control air pollution, which we covered in a previous article. When emissions are controlled at the source or removed with plants, note that there is no energy expense. Ventilation requires electricity, but it is a necessary building system, so responding to air pollutants only comes with a slight incremental cost. Finally, air purifiers come with additional capital costs and operating costs, so the recommendation is using them as a last option when VOC levels cannot be controlled with other measures. The main use of the indoor space being analyzed. Occupancy is not always correlated with air pollution. Some activities that are carried out by few persons release large amounts of pollutants; cleaning is a clear example, where many indoor surfaces are exposed to chemicals with a high content of VOCs. Pollutants may be released when there are no occupants at all, and off-gassing is an example of this. To guarantee indoor air quality (IAQ), ventilation systems must be capable of direct response to pollutant concentrations. This is only possible if ventilation controls are supplied with air pollution data, which can only be gathered with a reliable air monitoring system. 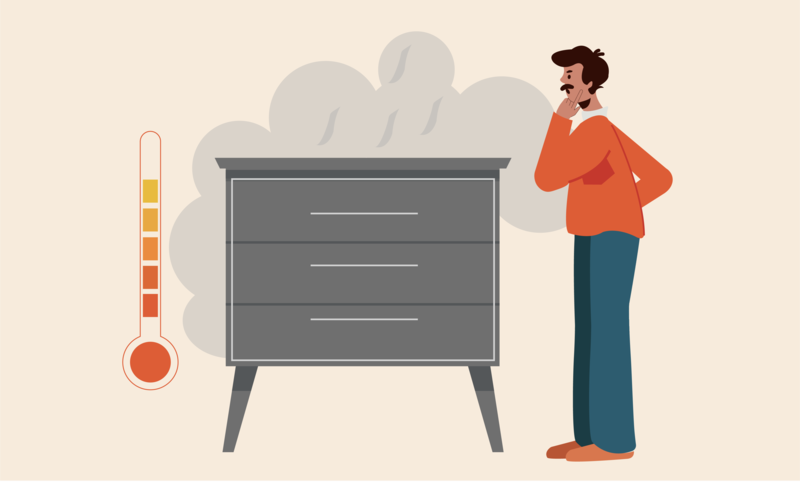 Volatile organic compounds can be very deceiving, since many of them actually have pleasant smells. As a result, human senses are not reliable for providing an assessment of air pollution. The smell of a new car is a clear example – many people actually enjoy the smell, but it is caused by harmful VOCs released from newly-manufactured components. When you enter a new car, it has a strong specific smell: that’s because of the higher VOC off-gassing rate. Over time, the smell will disappear and eventually you’ll breather clean air. Ventilate, either with your HVAC system or by opening the windows, by using fans etc. Heat. As offgassing rate rises with temperature, a heater may be useful. Let a new product air out before using it. This one is not easy, especially for a couch or a mattress. There’s no specific duration but the longer, the better. Off-gassing is a source of VOCs that can easily go undetected, since it is not associated with occupancy or with any indoor activity. There is evidence that off-gassing increases at higher temperatures, and it is more of an issue in spaces that have been recently built or renovated. Products such as furniture and electronic devices are also notorious for their higher out-gassing rates when they are new. To control the accumulation of air pollutants, you need a ventilation system that responds to them, and this concept is only viable if you have a monitoring device that can detect pollutant concentrations in indoor air. Foobot offers VOC detection, and its measurements can be used to control ventilation and air conditioning equipment.